Momentum is building behind one of the NMA’s most important legislative initiatives: Enacting civil asset forfeiture (CAF) laws to prevent law enforcement agencies from seizing (and profiting from) the property of citizens ─ often motorists ─ who have not been convicted of an underlying crime. Under Attorney General Jeff Sessions, the Department of Justice has become more aggressive in promoting CAF, even in cases where a person is never charged with a crime. On July 26th, the NMA joined 19 other civil liberties organizations such as the ACLU and The Institute for Justice in sending a letter to members of the U.S. House of Representatives urging them to adopt an amendment that would put into place the reform that is desperately needed. Here is a link from the NMA site with the contents of that letter. Our lobbying efforts with Talley & Associates in Washington DC are paying off on the same front. The congressman who has led the charge for national CAF legislative reform is interested in working with the NMA to build a grassroots movement to push a shared agenda to restrict the conditions under which enforcement agencies can seize property. Be ready to act. With Congress entering a recess period until late August, this is a quiet period but we will send out another alert later this month with specific information of who to contact in Congress along with key points to be hammered home on how civil asset forfeiture policy must be amended. This is an issue that requires everyone’s involvement because under the current direction no one is immune from having property taken, due process be damned. This is not just a current administration problem. 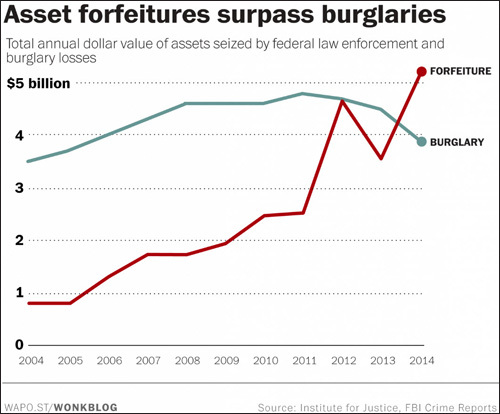 Note in this graph from The Institute for Justice that the U.S. government dating back to 2013 has seized more property than the value of all other burglaries combined. That trend has grown and shows no signs of abating unless everyone gets vocal about the need for change. As an example of how far wrong forfeiture procedures can go, read the cover story (The Fourth Amendment Under Attack) of the Winter 2018 issue of Driving Freedoms. Look for our CAF action alert in a few weeks so that we can work together to accomplish a much-need goal: To effectively end indiscriminate asset forfeiture by the government.